Junior ring ceremonies mark the transition of underclassmen into upperclassmen. Juniors are presented with their school rings, which symbolize their becoming the future senior class and the potential leaders of their school. Because the event holds more significance than the mere presentation of jewelry, consider one of the many ways to personalize and commemorate the occasion. Juniors likely hold varying opinions on what being a senior means to them. Teachers can have each participant fill out a card describing the significance of this new stage and the ways in which they plan to make a positive change among the student body. At the ceremony, several cards can be randomly drawn from a basket or box and read aloud to the audience. Alternatively, the participants can share their contributions themselves after receiving their rings. Instead of a ring ceremony culminating with a reception, you can host the ceremony in the form of a tea, brunch or dinner. The school can sponsor meals and nonalcoholic punch or the students can be asked to contribute funds or a dish to the event. This can be followed by a formal ring dance, exclusively for the junior and senior classes. The junior class can choose a theme for the dance and decorate the hall accordingly. Candles are symbols of triumph and light. Juniors can each be given a candle at the end of a ceremony and present it to their parents as a show of gratitude for their support during their underclassmen years. 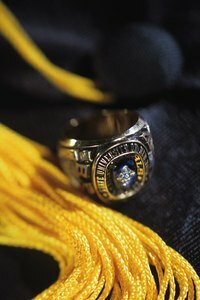 Instead of the rings being presented by faculty members or the featured speaker, the parents can present the rings to their children in exchange for the candles. For an even more dramatic effect, it can be a nighttime, outdoor event. For faith-based high schools, an alternative to customary ring ceremonies is to host a religious service. The principal should invite a religious leader to share a message with the students, or allow a student committee to plan and conduct the service. Some features include a reading from a religious text, praise songs, religious dances and a prayer for the junior and graduating classes. The rings can also be blessed by a religious leader before they are presented to the students. Candlehome: Candle Traditions, Belief, Symbolism, Etc.